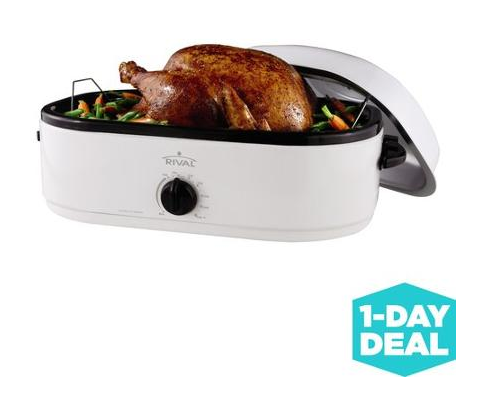 Rival 20-Pound Turkey Roaster with Capacity Maximizer $17.88 + FREE Store Pickup (Reg. $25)! You are here: Home / Great Deals / Rival 20-Pound Turkey Roaster with Capacity Maximizer $17.88 + FREE Store Pickup (Reg. $25)! If you’ve been wanting a roaster, today is THE time to snag this HOT deal! You can get this Rival 20-Pound Turkey Roaster with Capacity Maximizer for just $17.88 (Reg. $25)! Shipping is FREE when you select Site-to-Store Pick Up (if available in your area)!